Our aim is provide policy officials in the department with support and guidance to help them develop policy. 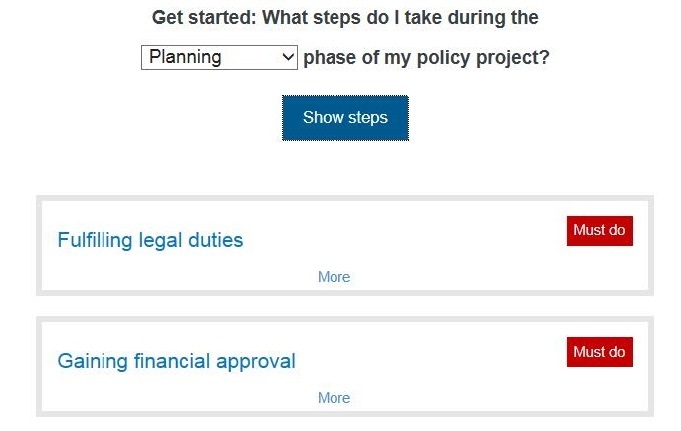 It’s built around the department’s 6 Policy tests, and provides advice for staff about how to develop policy in the department, as well as when and how to involve others. It’s not the first time we’ve tried to do something like this. 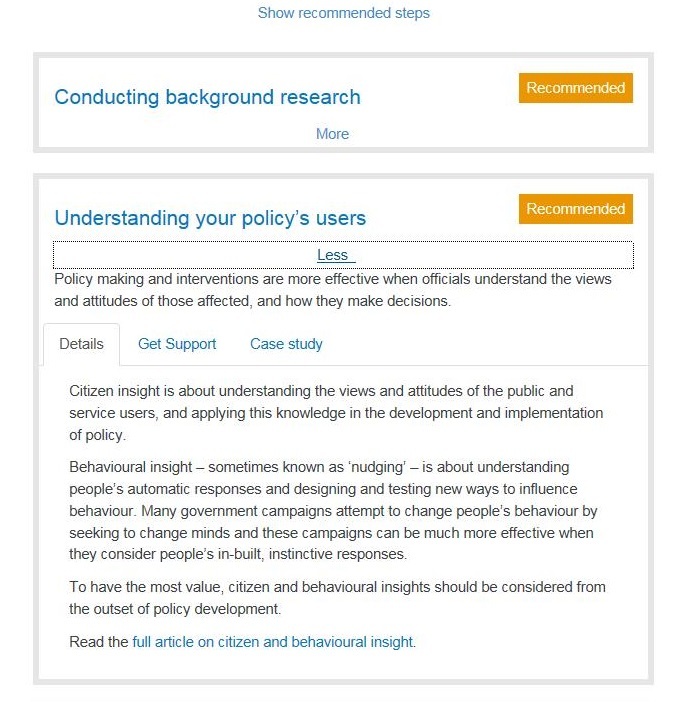 A year or so ago we launched the beta Digital Toolkit for Policy Makers. The digital toolkit was developed and written by the digital team, and largely for our own benefit, rather than the benefit the people we wanted to use it. Policy makers didn’t always understand what we were talking about, or how they should use it. And some found the interface confusing. As a result of this, and the findings of a subsequent user discovery project run by @liamking, we’ve built a new tool written in a way that make more sense to our target users, giving them access to information when they need it most, and not just about digital this time. Those outside of the department can’t see the PolicyKit at the moment, although we may make it available more widely later. The tool is based on taking a series of ‘must do’ and ‘recommended’ steps. When users select a step it shows an overview, contact details of the team responsible for the action in the department, and a short case study. And it provides onward links to detailed articles on the intranet if people want to find out more. We are going to keep testing the PolicyKit because we want to make it more useful over time. We’d like it to become a place where people can work on live projects (something users asked for during the development process), with tools to help them do it.